I have reached the point in the project where I feel comfortable listing in advance! 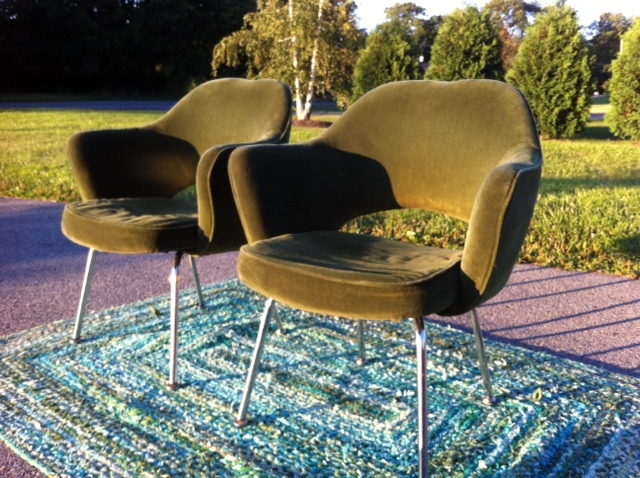 I just finished the first Eero Saarinen chair and will be starting the demo of chair #2. I already cut the seat foam so it should go pretty quick. I hope to have it finished this week. Please message me to hold them for you! I priced at $600 for the pair, which his seriously well under others without repairs. Shipping is additional and I will quote for you to your nearest Greyhound station. Delivery and meet up in my region (eastern/central PA, NJ areas) is always welcome if we can arrange it. I'm comfy again! Soft new foam and ready to rock! I love Elmer's Spray Adhesive! I even glued the Knoll sticker onto my new dust cover!